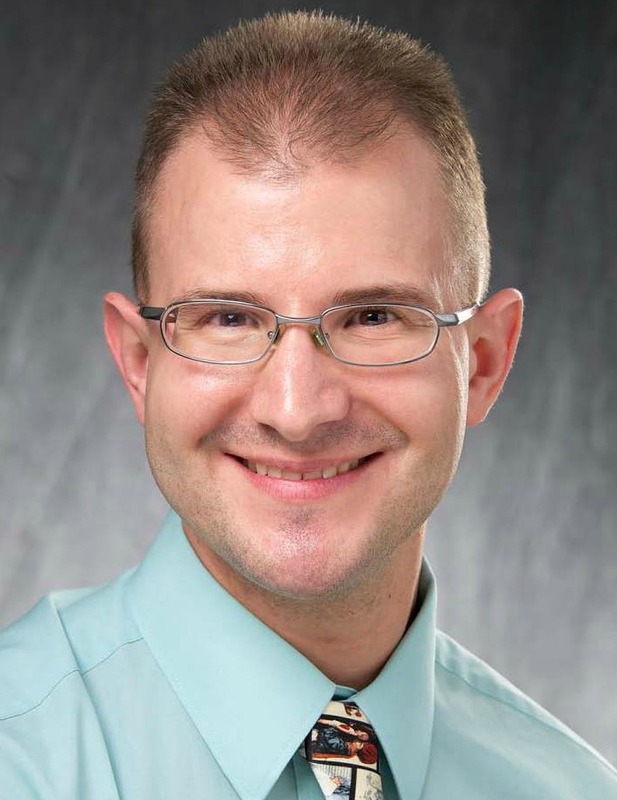 Cancer survivorship issues are close to Dr. Brandon McNew’s heart. It’s not just because he treats kids with cancer as a pediatric oncologist — the St. Baldrick’s researcher was diagnosed with leukemia when he was 10 years old. Read on for more about his childhood cancer journey, why he was drawn to pediatric oncology and what he’s doing (with a little help from St. Baldrick’s) to help fellow cancer survivors live long, healthy lives. Dr. McNew is both a St. Baldrick’s researcher and a shavee. He rocked the bald at a Cedar Rapids, Iowa event in 2015. For Dr. Brandon McNew, treating kids with cancer isn’t just a professional calling. It’s personal. That’s because Dr. McNew is a childhood cancer survivor. 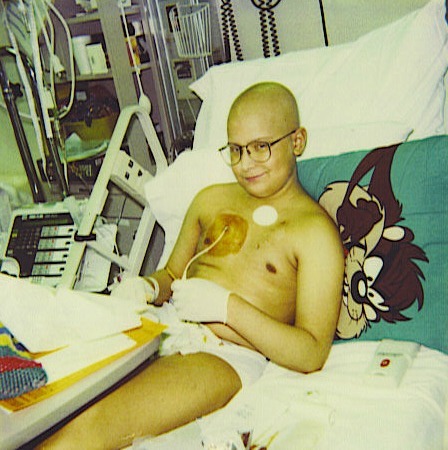 In 1993, when he was 10 years old, he was diagnosed with acute lymphoblastic leukemia. “I underwent at that time what was the standard of care, of treatment, which we’ve made pretty radical improvements on in the last 20 years here,” he said, explaining that he received intense courses of chemotherapy. Then he relapsed. He endured a bone marrow transplant, but his remission didn’t last. He relapsed for the second time. Seventeen years after being declared cancer free, Dr. McNew now runs the Blank Children’s Hospital Pediatric Cancer Survivorship Clinic in Des Moines, Iowa. The recipient of a St. Baldrick’s Infrastructure Grant, the clinic connects survivors to a pediatric psychologist, a physical therapist and a nutritionist — thanks to the funding from St. Baldrick’s. Dr. McNew during his bone marrow transplant back in 1996. These services are crucial to helping childhood cancer survivors thrive, because the toxic therapies they receive can result in everything from cognitive difficulties, which can impact their schooling, to physical challenges, which can cause a host of other health problems, including obesity. “It’s all a big circle. It’s all connected and all of it is stemming from the therapy that they received to cure their cancer, which is usually the first priority and not necessarily focused on dealing with the long-term late effects,” Dr. McNew explained. Dr. McNew is familiar with intense cancer treatment and the short-term and long-term effects. He sees his doctor once a year for a checkup and gets his heart examined, because the type of chemotherapy he received is known to weaken the heart muscle. Thankfully, the changes to his heart have been small. During transplant, he suffered with pneumonia, shingles and a recurrence of the chicken pox, which caused scarring in his right eye. Because of that, he got a corneal transplant. “But short of that, I’m actually in pretty good shape, considering,” he said. His experiences have given him a unique connection to his patients — one that keeps him fighting for them and one that drew him to the field in the first place. Dr. McNew wants his patients to not just survive. He wants them to find their own passion and their own fire. He wants them to thrive. And he’s here to help. Help childhood cancer survivors live long and healthy lives. Fund critical efforts, like Dr. McNew’s survivorship clinic, today.